As the traditional-age student population shrinks in Massachusetts and recovery from the Great Recession continues, how are public higher education enrollments being affected? The latest estimates of fall 2016 enrollment are available now. Following a peak headcount of 196,847 in fall 2013, fall enrollment at Massachusetts public colleges and universities has been on the decline. Fall 2016 enrollment is estimated at 186,103, a 5.5-percent decline from fall 2013. The National Center for Education Statistics, the Western Interstate Commission on Higher Education, and the UMass Donahue Institute all projected a decline in the number of students graduating from Massachusetts high schools during this decade, which would logically lead to reduced public higher education enrollments. The long-term trend for enrollment in Massachusetts public higher education clearly shows a pattern of high peaks followed by valleys. The community college segment has seen the steepest declines, with a 13-percent enrollment decrease since its peak in fall 2012. These recent declines follow years of unprecedented enrollment growth, however. Rapid growth from 2006 to 2010 coincided with both a boom in high school graduates and the onslaught of the Great Recession. Additionally, community college enrollment has historically been more volatile than enrollment at the four-year institutions. Meanwhile, growth in state university undergraduate enrollment has slowed in recent years with slight enrollment declines the last three falls, and recent increases in undergraduate enrollment within the UMass segment are associated with a notable increase in international student enrollment. 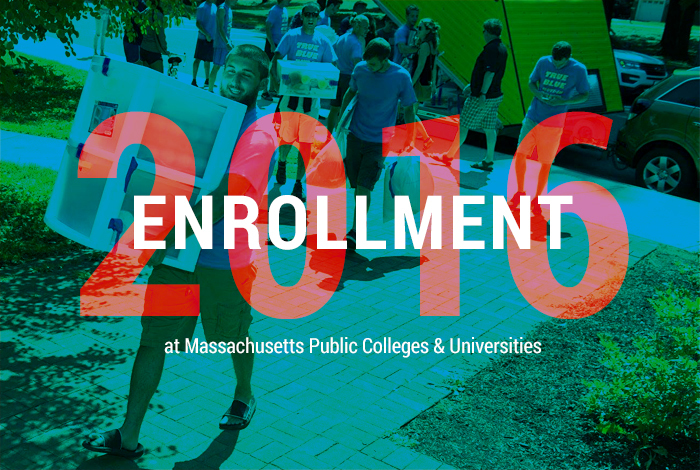 View the entire 2016 Enrollment Estimates presentation, which also includes a demographic profile on new undergraduate students in Massachusetts public colleges and universities.